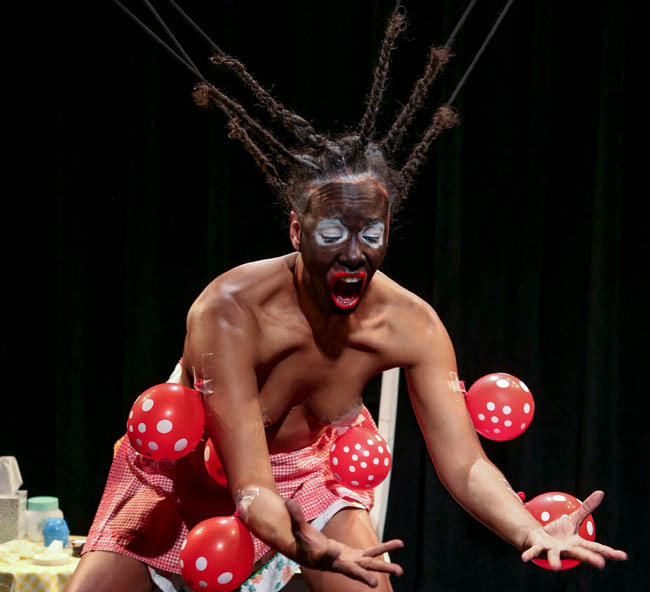 Connected like a puppet to objects that have informed the Black experience in America, multi-media artist Edisa Weeks alternates between black face, white face and visceral dance to dig into the foundations of Liberty in America. As our nation grapples with confederate monuments, Black Lives Matter, fake news and economic stratification; THREE RITES: Liberty humorously and poignantly insists on a reckoning with our past and present. THREE RITES: Liberty is part of a trilogy on Life, Liberty and Happiness. THREE RITES integrates live music, dance and two visual installations to examine how life, liberty and happiness are guaranteed and pursued in America; and how these rights manifest in the body. This performance contains content that may not be suitable for young children. Join multi-disciplinary artist Edisa Weeks for an afternoon of making roots out of paper and twine, while enjoying food, drinks and conversation. Edisa is making one thousand eight hundred and sixty-five roots in recognition of the year 1865, when legalized chattel slavery ended in America. The roots are for the performance installation, THREE RITES: Liberty, and will dangle from the ceiling to the floor to create an environment that the audience separates and moves through (as if moving through history), to find open spaces containing reflections on liberty. The conversation at Mount Tremper Arts will be about water conservation/rights in the watershed. If you have one - or two - bring small black plastic bags (like you get from a convenience store) to help make objects for THREE RITES. Edisa Weeks is a choreographer, educator, and director of DELIRIOUS Dances. She creates intimate environments that merge theater with dance. Her work has been performed throughout the US and in Germany. Weeks teaches at Queens College and has received awards from Artists International, Brooklyn Arts Council, New York Foundation for the Arts, and others. Marýa Wethers is an independent creative producer/manager, consultant and curator, Bessie Award-winning dancer, and Director of International Initiatives at Movement Research. She has curated at Gibney, Queer NY International Arts Festival, and Out of Space @ BRIC Studio for Danspace Project. THREE RITES: Life, Liberty, Happiness is a National Performance Network/Visual Artist Network (NPN/VAN) Creation & Development Fund Project co-commissioned by 651 Arts, RestorationART, Mount Tremper Arts, and NPN/VAN. For more information: www.npnweb.org. Photo of Edisa Weeks by Lance J. Reha.